Of the millions of people who use Outlook, most only use about two percent of its features. Don’t stay in the dark! 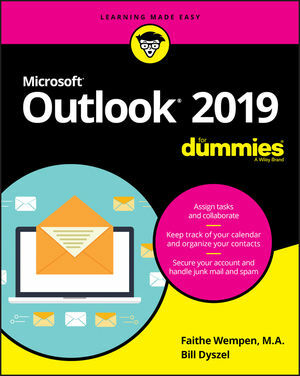 Outlook 2019 For Dummies shows you how to take advantage of often-overlooked tips and tricks to make it work even better for you. Inside, you’ll find information on navigating the user interface; utilizing the To-Do bar; filtering junk email; smart scheduling; RSS support; using electronic business cards; accessing data with two-way sync and offline and cloud based access, and much more! If you’re upgrading to the latest version — or have never used this popular email tool — this book makes it easier than ever to get Outlook working for you. Faithe Wempen, M.A., is a Microsoft Office Master Instructor and the author of over 150 books on Windows, Office, and computer technology. Bill Dyszel is an author, consultant, and speaker on the topic of technology.